Now you can perform amazing freehand design using a collection of new design options that was, until now, only possible in graphic design programs like Photoshop. 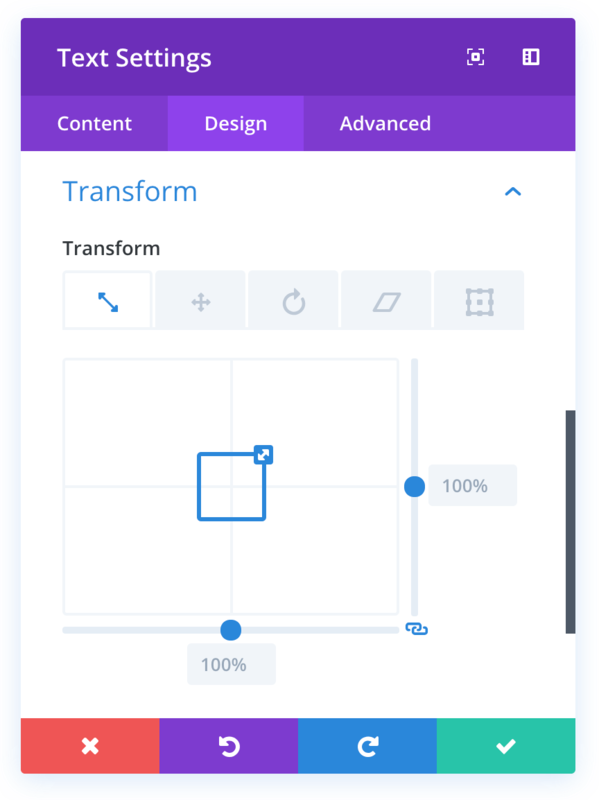 Today we are introducing a brand new feature to Divi that allows for amazing freehand design within the Divi Builder, giving you the power to transform elements right on the page in ways that would typically only be possible in graphic design programs like Photoshop and Sketch. You can move elements around, scale them up and down, rotate on three different axis, skew and adjust the transform origin with ease. All of this is done using a super slick new interface that makes each transformation easy to perform and understand. We spent extra time building the Transforms interface to make sure it was super intuitive. The result is a set of options that are as easy to use as they are powerful. With the new Transform controls, you can easily adjust the appearance of any module, row or section using a combination of new settings. 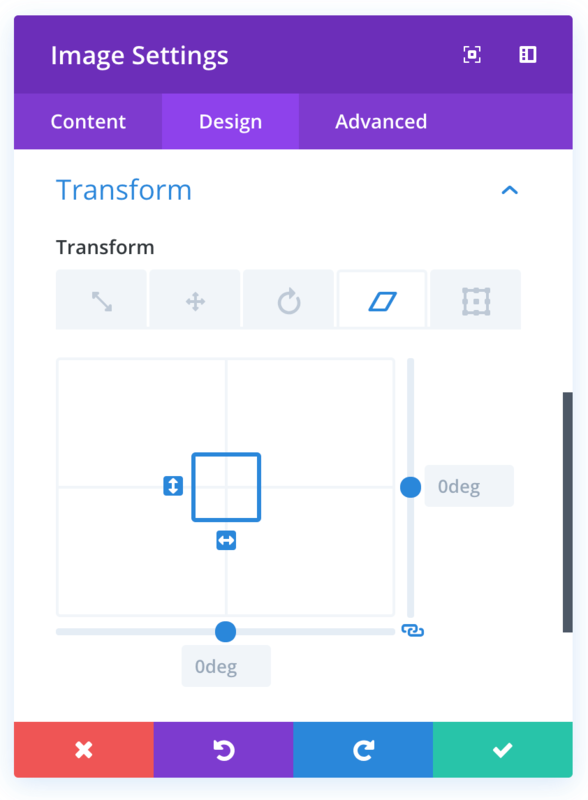 The Transforms interface has been built to allow for visual control over your design. Instead of a long list of indistinct sliders, Divi presents you with visual controls that describes each transformation in a visual way. This is mirrored on the page as you watch elements transform right before your eyes. It’s really fun to play with, but more importantly than that, it’s also really effective at unlocking tons of new design possibilities. Using the Scale control, you can quickly adjust the size of anything. Scale entire modules up and down with a single move of your mouse. When you adjust an element’s size, the entire element and all sub elements are adjusted at once. By default, scaling elements will keep the original aspect ration, but you can also unsync the height and width settings and adjust them independently. You can adjust an element’s position using the Translate control. Move elements around in any direction without worrying about the surrounding parts of your page. When you move an element, it moves independently of its surrounding elements and parent element. This is similar to using absolute positioning in CSS, except the position is based on the element’s inline position instead of the position of its parent relative element. You can also rotate items using the Rotate controls, which allow you to rotate on three different axis for a full range of three dimensional rotation. You can combine different rotations to create some pretty cool effects and save tons of design time. For example, instead of opening an image in Photoshop and using a mockup template to create some 3d image effects, you can just open the flat image in Divi and transform it inside the builder. If you ever need to replace the image, you don’t have to edit it again in Photoshop! You can skew elements to create compelling depth effects. Much like the Scale control, you can skew elements with a locked aspect ratio, or you can unlock each side and adjust them independently. Combining Skew and Rotation can lead to some pretty stunning 3d effects that add depth and complexity to your page. 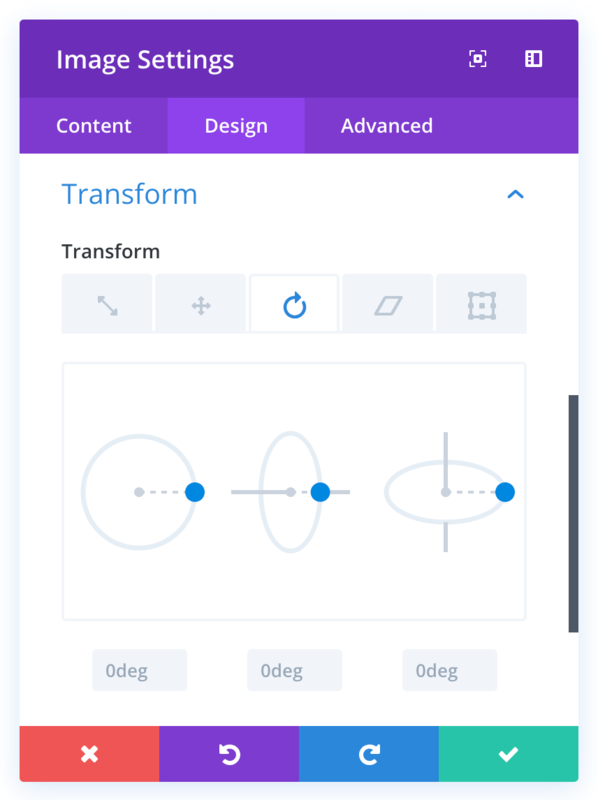 Finally, you can adjust the transform origin, which will affect all of the transforms added to any element at once. This option allows you to change the position of transformed elements. Two dimensional transformations can be adjusted across the x and y axis. These transformations are also animatable on hover, allowing you to create some simply stunning hover effects that were never possible before. Combined with all of the great design features that Divi already has, the possibilities are pretty incredible. When you transform an element, it doesn’t disrupt the elements around it. You can stack things on top of each other and create beautiful collages with different modules. This allows you to easy “break free” elements from their parent columns or rows, allowing for module overlay effects that can add a sense of fun and playfulness to any design. 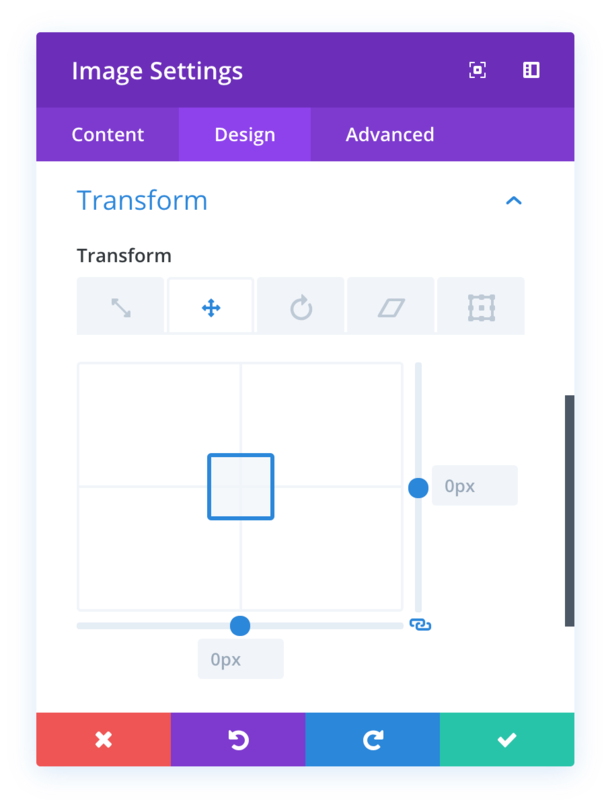 The brand new Transform controls are available today, so download Divi and take them for a spin. Let us know what you think in the comments, and don’t forget to check back next week for even more great Divi features coming your way. It’s Our Anniversary Celebration Plus The Biggest Discount Of The Year So Far! You’re in luck! Today Elegant Themes turns 11 year old, and to celebrate we are offering our biggest discount of the year so far. That’s double our normal discount, but it will only be available for a short time. Don’t miss out! Renew Your Account Today For 20% OFF! YES!! Finally position control! Something other visual builders have had for a long time! THANK YOU ET! Can we get a better menu making system? I know you can buy plugins and a mega menu can be made in menu but it takes a lot of fancy css to make it work well and what not. I am trying to use mhmm and the design process is not easy. to do even though I love the capabilities. Yes I need to learn more I know that. But would be nicer and save time if a nicer tool like this awesome transforming tool was put in? Any plans on menu enhancements? Overall I love the DIVI product Nick! Karl try Divi Mega Pro from DiviLife. You might find it a lot easier. While we all wait for ET. No gonna lie. I would so love to have the ability to design a mega menu within Divi itself without having to utilise 3rd party plugins etc. I can just imagine how amazing Nick and the team would make it!!!!! From both the experience and functionality. Super cool! Looking forward to using this on our sites! Holy cow! No way! this is AWESOME! Couldn’t say it better myself…great work Divi team!! I usually do not comment…and …I mean…how can you comment on such a thing of beauty? FIRST COMMENT! OMG Yes!! I’m so happy this finally came out!!! Now we just need the Theme Builder! GREAT WORK ET Team!! So awesome!!! A small tutorial will be apreciate, love this new feature. Thank you! Pretty cool stuff. Absolutely something valuable that clients will love. This is A M A Z I N G. I love the constant improvements of the front end builder. When it was first released I was hesitant to use it because I was so used to the backend editor but now it’s all I ever use. Good job! Looks better than I expected! I probably won’t use these very often, but they will be great tools to have available. Nick, This is an amazing new feature. Thanks ET Team. GOD! DIVI! I LOVE YOU SO MUCH!!! THANKS! Wowsa! I can’t wait to try this. And THANK YOU – Nick and Company – for creating such amazing products and features! Exciting new features. What are the implications for image size and load time? Given how large some elements can be, might there be a need to re-optimize the image after you have set the parameters? This is almost certainly done using CSS transformations, which have no impact on the load time for a given image asset. Wow !! It’s awesome !! This is a great update !!! DIVI is most powerful in design tools!! Which browsers support this? If all modern browsers, than this is game changing! It appears these 2D transforms work as far back as IE 10(9 with prefix) and in all modern browsers. So yeah, you’re good to go. Amazing Update, i’m so exited to try it, i love divi. Wow, Nick! This is simply incredible. I look forward to exploring these new transformation features! Your team has done a wonderful job as usual! This is so cool! I was just using css code today that this will replace. Big time saver! Fantastic! I really look forward to experimenting with this. Divi just keeps getting better all the time. Very impressive, guys! Thank you very much. Ok how do I get it?? I just updated to the new version of Divi, but I am not seeing it in the elements on the page! I NEEEEED THIS! 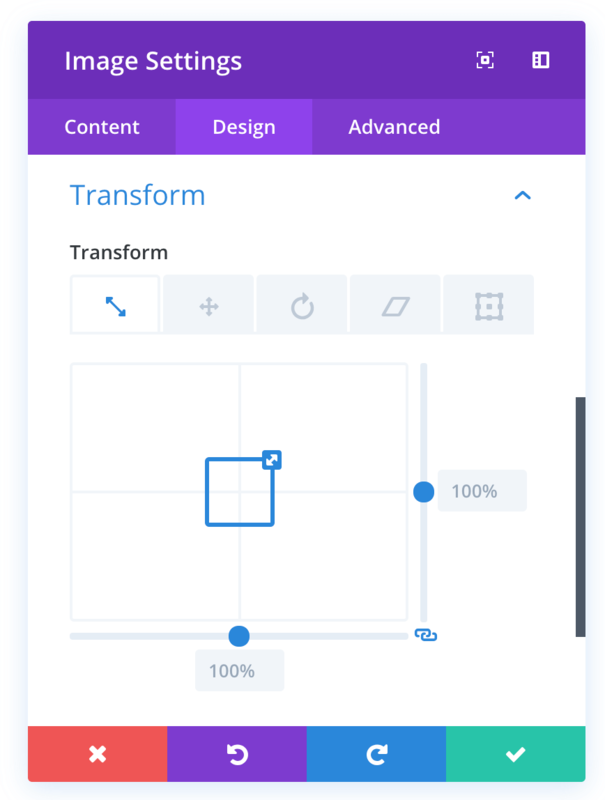 it’s on the design tab of each module, between filters and animations, there’s a new a section called transform. Same for me! Even with the update, it does not appear. This is what I have been waiting for. This is so great it is going to make designs come alive and much easier to get these effects. Keep going Divi cannot wait to see what is installed next. Wow! This is an awesome feature. Amazing!! How much better it can get? I am getting worried that at some point WordPress users will match Divi users and competition upon web design with divi will become incredible. You shouldn’t be worried if you are confident in your skills and the value that you provide. You can give anyone a hammer but that does not mean that they can build a house. Same applies to good web development and design. Yeah. Also curious how the elements will act on mobile devices (in regards to placement). But seems like a great tool. Look forward to testing it out. Thanks for the update! That was my question also…how will it perform across mobile platforms? This is epic. Super excited to try it! Wow, nice feature for web design. I like it. You guys at Elegant Themes are amazing. Thank you for all your hard work and dedication to making an already awesome product even more outstanding. You rock!!!!! Amazing update! Can’t wait to start experimenting! Would be cool if you guys could now add this to the WooCommerce Product Grid Images! I’d see some pretty pretty cool shop layouts coming that way! Also are there any plans on improved Shop Layouts? Good to see you guys putting such great updates out! Super slick. Amazing how this opens up easy to apply design ideas. . Can’t wait to try this. That said, would love to see some basic WordPress options added that have been missing for a long time, like image captions. Or be able to display images in the portfolio module without cropping. YES was just wishing this week we could have captions…what could be more basic??? Thanks again for staying committed to growing Divi..! Same here. These changes are great and all but more header options are really needed. Absolutely!!! There are so many options clients want up there and it’s a pain to get them what they want. Honestly, that just blew my mind away! I love this. Seriously. Divi is becoming the best front-end builder even if you decide not to use it for other than UX. The lack of header & footer options is really frustrating. The “Theme Options” is such an isolated tool; and the fact that you can’t create Templates (post_types; archive pages; other custom taxonomies as those brought by WooCommerce or LearnDash) with Divi makes this tool a great option for static / basic websites deployment (certainly better than any other option out there; better than Wix; and slowly getting ahead of Webflow) … But not suitable for truly WordPress websites that take advantages of all the things you can accomplish with such a strong framework. Divi should aim to compete more with Oxygen, Bubble.is; and less with SquareSpace. Please add more back-end functionalities! Hi Daniel, Vlad! I love too this new addition to the front end workflow! And I also ask Elegant Themes developers to add everything you said to make the Divi framework a more solid option for more advanced WP designs. Pleaseeee work hard on implementing this aspect soon! The lack of header & footer options is really frustrating. The “Theme Options” is such an isolated tool; and the fact that you can’t create Templates (post_types; archive pages; other custom taxonomies as those brought by WooCommerce or LearnDash) with Divi makes this tool a great option for static / basic websites deployment (certainly better than any other option out there) … But not suitable for truly WordPress websites that take advantages of all the things you can accomplish with such a strong framework. It would be useful to be able to animate – say a 1cm sq image slowly enlarging to a 10cm image as an example. If you mean on hover, you can do that. In the Transform options group click on the cursor icon to enable Hover and then you will see to tabs, Default and Hover where you can adjust each option individually for the default and hover states. I think Michael is asking for controls to set up the animation parameters. This is an excellent added functionality for expanding UX in a dynamic and meaningful way to any extent and degree a design and layout calls for. GREAT WORK!!! Whoa, this amazing! Thank you so much! A long time ago I was criticizing but today I say. Oh my God!! This update is great. I loved this update this fantastic. Congratulations. I really do not expect to find this in Divi. The features were already amazing but this one takes the cake, Absolutely marvelous, couldn’t believe my eyes. You guys are great and making us look good. It’s weird, because only the other day I was thinking that this sort of functionality would be the next logical development. I can’t wait to start experimenting with it. Wow this looks great, will the transformation controls also be available in EXTRA? Only took 6 posts before …. “but I wish we had….” comment… is that a new record? Awesome addition to the Divi!!!!!! That’s incredibly beautiful update. .
Wow. Just when you thought Divi couldn’t get better, they find a way to defy expectations yet again. Is walking on water in the works? When finally a release of some improvements to the “DIVI Theme”? Eg: the very, very simple possibility to change background colors of sidebars or some more possibility for header and footer. Actually DIVI Theme is a very limited and basic theme. Not at the level of the other theme on the market. 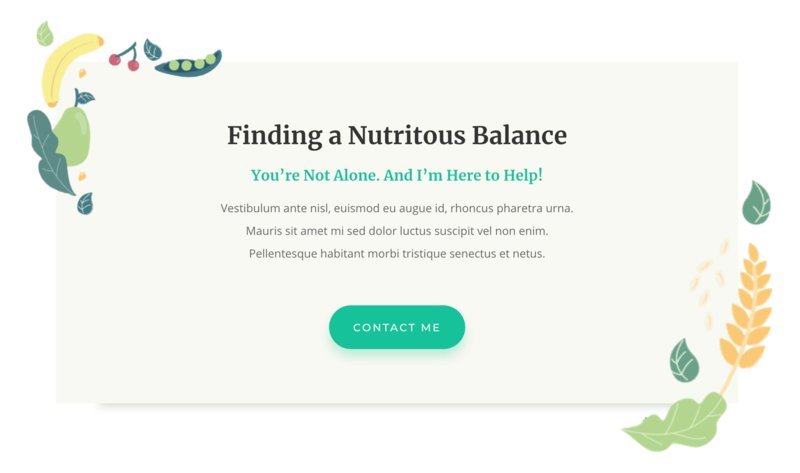 After more than a full year I have not seen any minimal improvement in the DIVI theme. I lost something? Yeah, just wait 2 more months and we’ll celebrate this sneak peeks one years anniversary! Will we get a 20% discount again then? Or maybe we will finally get the actual theme builder by then to celebrate! And in one month Elementor will celebrate actually HAVING these features for one year. I’m a lifetime ET member but I switched to Elementor Pro because of the constant promises that Theme Builder was going to happen “any day now”. I’m sure a lot of the more “developer” types using Divi did the same as I. The problem is that now that I have built many sites with Elementor, I see no reason to come back to Divi. Perhaps when this finally happens I’ll redo some of my Divi sites where I had to use 3rd party plugins for CPTs. Maybe. This is a Great Feature… Thanks! We Really Need this kind of Control with HEADERS, Menus, and FOOTERS… I obviously haven’t tested this yet, but if this does not work with them, can you please make it so…? The biggest missing feature with Divi is the Header Customization and Mobile Menu. It would be nice to not have to write Custom CSS to have Branding, adjust the logo, Buttons, CTA’s, more Info, make them sticky, etc… especially on mobile. I was expecting tighter integration with Gutenberg to come next, but you surprised me with this fun feature. I guess this was the feature that was ready. Anyhow, keep up the good work. Love the new improved support system, too! And i was even happier at the end of the video when Nick confirmed that they can be animate-able on hover. Not to be a bummer but keep in mind that your hover effects will not work on mobile for potentially half of your viewers. I just want to say, I guess it was over 4 years ago (time flies!) that I first went all in with Divi for my new clients. Since then I’ve built hundreds of new sites using Divi and have never looked back. You guys seriously rock – thanks for making our jobs that much easier and even fun. Thank you so much, this is wonderful. Thanks to ET team. Switching to Divi last year was the best decision I ever made. I replaced every previous theme with Divi and couldn’t be happier. I use it on every website I create, and I feel confident in knowing that it’s a builder and integrated wordpress system that is not going to be abandoned by the devs like so many others are. Thanks Divi, keep all these great features coming. This is amazing!! I WANT IT!! Question.. how do I apply this to my installation of Divi? Great job…..To top the cake would be POPUP feature modular! What impact is this going have on screen readers and accessibility? I’m definitely going to be utilizing this feature. Now I don’t have to use photoshop to get this effect. What’s next ET Team??? When are we getting a full divi woocommerce integration? Elementor is way ahead of the curve with the Woo stuff. Also, what about the header and footer builder? Any multisite role editor feature of some sort coming soon??? WooCommerce Modules (https://www.elegantthemes.com/blog/theme-sneak-peeks/divi-feature-sneak-peek-woocommerce-modules) is close to being ready and the Theme Builder (https://www.elegantthemes.com/blog/theme-sneak-peeks/divi-feature-sneak-peek-the-divi-theme-builder) is in the works. You blow my mind. It’s excellent feature. Well done. It used to take some extra time to do it with Adobe software, going out of WP environnement. And it looks so simple now. This is an amazing new feature. I’m trying this feature with the Advanced Animations but it doesn’t seem to work properly. Have you tried it? WOOOWWWWWW! This is an amazing new feature for creative solutions! Thank you, keep ’em coming!!! We LOVE Divi! Well this would have saved me several hours last night. Still, this makes me very happy. Yay hay. Now I can do that Hilda Ogden flying ducks Cornation Street tribute page I’ve had in the pipeline for the last while. truly great guys! I’d love to see more scroll-animation controls in the future! Keep it up. Looking forward to using this, Divi lifetime was or is the best investment EVER!! Great feature. ¡Happy Anniversary, ET! 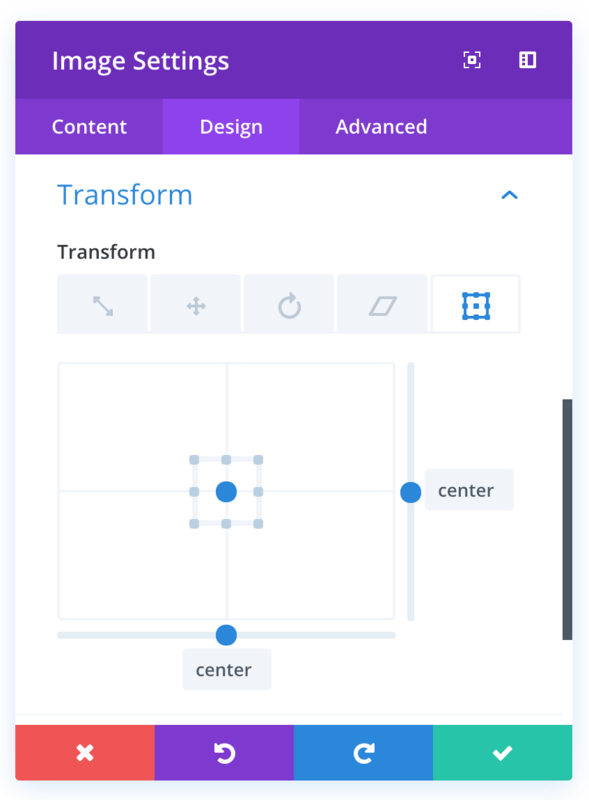 Transform modules looks great and I can’t wait to give it a go 🙂 Divi just get’s better and better – every day it seems! It truly is one of the best WordPress themes available. Great work and thank you. Wow! The best gets better! This is enough to make you want to smack your grandma! AWESOME! Great tool! I will definitely try it. Thanks ET! This is true amazing!! (for non web-designer) bringing webdesign to transform people idea & life experience..!!! keep up the true good work.. Still no full safari support on MacOS’s. Many animations just don’t work or are not possible to view in preview. Divi doesn’t seem interested in supporting the Mac browser OR safari is a pain for developers to work with…? Thank you for the video and the gifs showing how to use these, they are very helpful for non-programmers like me building my own site. And of course, thank you for the update! It’s lovely! Can’t wait for the others! Great improvement Elegant themes team. Such enhancements help us in ways unimaginable. This is amazing and while I can’t wait to start playing with it, I have to ask PLEASE PLEASE PLEASE fix your contact form…..
You have all this amazing stuff and yet every website I build I have to use a separate plug in for contact forms. Yours are easy to build, look good but DONT WORK. Consider investing a few hours looking into why, it would be much appreciated. This is so powerful Nick, This is a revolutionary move! I just an issue, I need to make dir=”rtl” in in the whole page.. or in a module .. I have two version language of my website, the problem in Arabic ver. I should change the whole WordPress language to get Right-to-Left alignment effect but still not affect on all element in my website. Elegant Themes must be recognized as a company that has harnessed the potential of technology for the masses. You have crafted our means of production. Frankly…for the uneducated (at least in the standard sense). The revolution you harnessed some time ago is contained in the idea that “normal people” can produce their thoughts in coherent, or event elegant ways, but more importantly translated by DIVI to share with the world. IOW you gave people from ALL walks of life a voice and vehicle. One day I will successfully add dimensions to such harnessing through a collaborative network, and further by evolving a collective conscience. Awesome! I want to try! Awesome feature, day by day Divi itself transforming into complete graphic application for web like photoshop. Unlike photoshop now we can easily play with images inside divi without touching it anymore. Thank you very much for giving us this incredible tool. This is great. It provides freedom to designers and let them focus on the core aspects without going back and forth which saves time. Themes are amazing I will definitely try it. Amazing. This could beat webflow. Amazing high quality interactions & animations now in-built in divi…. Advance animations lessons coming soon. THIS IS TOP OF THE TOPS! Guys, YOU ARE AMAZING! Thank you for the the best Interface for Web Designers. This is fantastic! Can’t wait to explore the new feature! Yeahhhh ! You ROCK ET ! As much as I love the look of these features I am wondering if the community even asked for this. Where is the header/footer builder? Surely this is THE most requested feature. I also look to Elementor for a very big step ahead. It’s very cute but where Woocommerce modules, where is the layout injector, it was presented in September 2018, it’s very long. Really fun to play with… One oddity though. Isn’t transformation styling included in the “Extend Style” option? I’v tried extending a transformation style to all blurbs or images in a row or section, without luck. Copy/paste tranformation style works well though. An omission or by design? Eagerly waiting for a theme builder. I liked it very much but how did I find it on my theme? I updated my Divi theme but still didn’t find it. Nice Feature – Visual Advanced Editing finally. In these Days no one is satisfied with Simple Editing. We all need Advanced ways to present our creativity! This is a good Step forward. Finally something new, was getting worried, no new features or updates for like almost months….. this is a good one. It’s amazing to see how Divi is changing and developing. Amazing work! Keep going! Congratulations Nicolas Cage. You are very good! Just another question, how did you do the video lightbox with all the effects on the player image too? These controls make Divi the best WordPress theme builder on the market. Congrats! One question…can you reorder elements when stacking? Gorgeous and powerful. Not as powerful as the long-awaited THEME BUILDER which I desperately need! Or just some more header or mega menu designs. Anything in the root theme to un-Divi, Divi. When does it arrive? Cannot wait to use it. Now! Update your theme. That’s all. Such as uploading massive 3000 pixel wide images and then scaling them down to 150px wide in the Builder. HA! I hope ET thought to include some sort of auto-crop to idiot-proof this. Ive been wanting the header and footer + Theme builder updates for ages … but this update is a welcome distraction! OK that’s a bit harsh, its not a distraction its a GREAT update! Sure has made my life easier. Besides, I used it since this morning wondering if it was a novelty that I had not seen! Love the candy but need theme builder and srcset more. Absolutely fantastic 🙂 Used it tonight for an update for a client, saved loads of time. Thank you to everyone at Elegant Themes for such an amazing builder and all the features you give. This update looks incredibly exciting! I can’t wait to try it out! One of the coolest updates! Thank you! Really awesome. Thank you for adding in new features to Divi Builder. This one is amazing. Great work! Very Cool! i love the overlapping feature…. All the time just desing and small future, but if we will get woocommerce modul, will be old. Thank you! Awesome new feature. FEATURE REQUEST: I would love to have true lazy loading wherever Divi uses images (backgrounds and Slider/Gallery/Image modules) and perhaps on the videos of Video Slider. To avoid any confusion with animations, with lazy loading is meant to defer the loading of an image until the point at which the user accesses a part of the page that requires it. Divi is an excellent builder but it burdens loading speed. With image lazy loading the performance gains will be significant, especially in designs which use quite some images. There are some good plugins out there but with limited applicability over Divi. Besides, it is not a very good idea, aiming at improving speed, to deteriorate speed by adding one more plugin. Do you have any plans for adding such feature and, if yes, which is the ETA? Hands down one of the best feature you guys released in a long time, simply because this level of freedom when it come to image manipulations was only available in places like layer slider or slider revolution. So glad you guys added this at last I can get rid of the plugins and design the way I like to work. Never before was something like this available on WP in a builder, you always had to get a plugin and be limited to their features and hope it worked with your builder. Really nice effects, but how can i manage z-index on hover. The slides on the left, are always shown under the slides on the right. ¿Any idea how to configure z-index to see always on top the active slide? Very beautiful. I would like to try it too, but in my modules there is no transform option, can anyone tell me why? Can’t wait to give this a spin (or rotate?) on a new website build! Lots of ideas already! Thanks for this guy. I’m dying for a new blog design features or a blog design plugin. Nick, with this divi will be a hit. Nice! Would love to see a tutorial for the hover effects in the “My Portfolio” section in the article which is pictured but not expanded upon much. I’m experimenting with transform on hover but the animation is wobbly and not graceful as shown here. Divi Team you are geniuses!!!!! Now it only comes down to my imagination! I have to wrap my mind around this. It seems that combined with the hoover function I can finally make a kind of ‘pop up on demand’. How amazing, thank you soooo much!!! Thank you for this great feature. It appears that this feature has disabled z-index or am I not doing something right? Please help. Just updated and I can’t find this new feature on the builder.. what went wrong? Maybe I am misunderstanding something, but this is just rollover and no animation feature? Any idea as to why ?